Each of these principles contributes to the overall success of your space. Today we will be focusing on Unity; This refers to a sense of uniformity or harmony in a space. One of the easiest methods of quickly and inexpensively unifying a space is with paint. The right paint color can transform a space of disjointed objects and help them relate to one another. A great example of a unifying color is Revere Pewter. It works well in multiple spaces and is an industry favorite for open floor plans. It is light enough for a small space and interesting enough for a large room. Often when a room needs updating from beiges or earth tones, Revere Pewter is the perfect transitional color to fix a space. 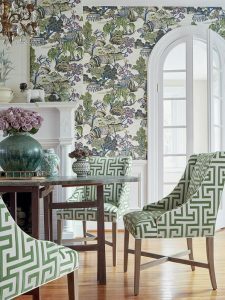 Utilizing prints from a single brand’s collection is a surefire method for achieving unity in a space. 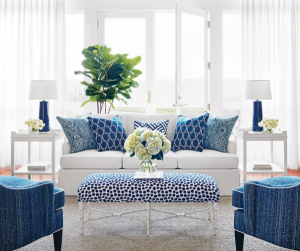 Companies like Thibaut have extremely user-friendly collections that help homeowners attain a unified and sophisticated look every time.